DUBLIN is set to be the ‘group of death’ in the European election as three ex-ministers, a sitting MEP, the President’s daughter and a well-known TD vie for just three seats. Nominations for next month’s elections closed this afternoon with 59 candidates putting their names forward across the three constituencies. The competition is expected to be fierce after the UK’s decision to hold their own vote, pending their departure from the EU. Ireland was to gain two extra seats – one each in Dublin and Ireland South – but these will now be put into ‘cold storage’ until Brexit actually happens. This means the battle in the capital will be fascinating. Sinn Féin’s Lynn Boylan is the only sitting MEP to defend her seat after Brian Hayes (FG) and Nessa Childers (Independent) decided to step down. Former Tánaiste Frances Fitzgerald will be fighting to retain the Fine Gael seat, while ex-children’s minister Barry Andrews wants to retake a seat for Fianna Fáil. But the late entry of Independents4Change TD Clare Daly has really shaken things up. Ms Daly will be expected to pull a strong vote. Other notable entries are Senator Alice Mary Higgins who is Independent and ex-communications minister Alex White who is running for the Labour Party. In Ireland South there are 23 candidates including three sitting MEPs, a junior minister and two TDs. Deirdre Clune (FG), Sean Kelly (FG) and Liadh Ní Riada (SF) will defend their seats. Minister of State Andrew Doyle is also running for Fine Gael, while the Fianna Fáil ticket includes Cork TD Billy Kelleher. 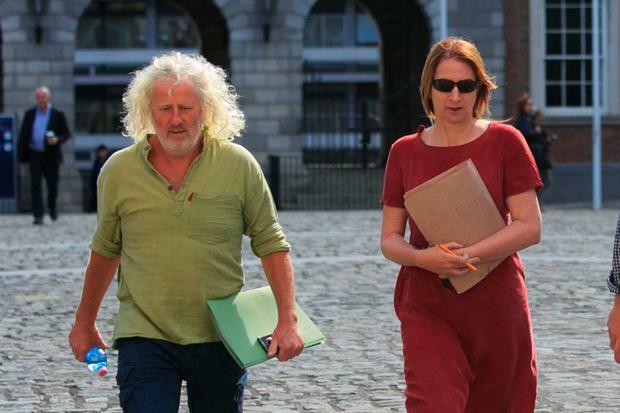 Ms Daly’s colleague Mick Wallace also submitted his nomination papers this morning. Meanwhile the vast constituency of Midlands-North West, which stretches from Donegal to Kildare, will be contested by 17 candidates. The sitting MEPs who are running again are Luke ‘Ming’ Flanagan (Ind), Mairéad McGuinness (FG) and Matt Carthy (SF). Fianna Fáil hopes to gain a seat here by running two TDs: Brendan Smith and Anne Rabbitte. But the dynamics of the contest have been changed somewhat by the emergence of presidential runner-up Peter Casey who is running as an independent.